KENNESAW, GA--(Marketwired - December 08, 2015) - Yamaha Motor Corp., USA, today announced the Yamaha Outdoor Access Initiative (OAI) has contributed more than $40,000 in cash to support two projects reflecting the program's expanded mission to promote safe, responsible use and open, sustainable access for outdoor recreation. Riding groups, land managers and others with a project that is in line with OAI's mission and in need of support should visit the program's newly updated website: www.yamahaoutdooraccess.com. The program's third quarter funding cycle coincided with the 88th National Future Farmers of America (FFA) Convention and Expo in October, where Yamaha represented its ongoing commitment to promote safe, responsible ATV and Side-by-Side vehicle use to the future leaders of the agricultural community. "The National FFA convention is an important opportunity to discuss riding habits for all uses of off-highway vehicles, particularly in agricultural settings," said Steve Nessl, Yamaha ATV and SxS group marketing manager. "Off-highway vehicles are incredibly popular tools on farms and ranches. Teaching respect for vehicles and encouraging safe and responsible behaviors in all settings and uses is an important part of the Yamaha Outdoor Access Initiative's expanded mission." Yamaha's multifaceted support of the National FFA and its members includes Yamaha's annual sponsorship of the National Agricultural Proficiency Award for Outdoor Recreation. 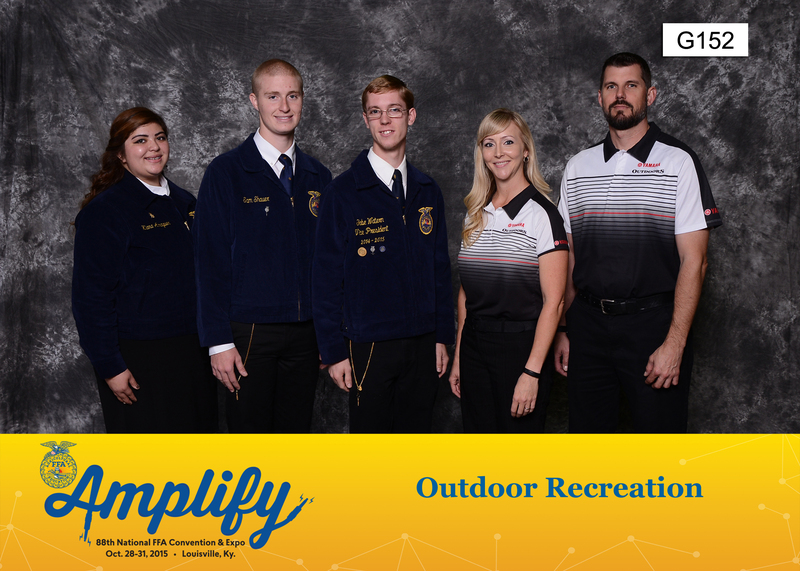 This year's Outdoor Recreation Proficiency Award was awarded to Sam Alan Shaver of the Southmont FFA Chapter in Crawfordsville, Indiana. Just before he was born, Shaver's father began what would later grow into the largest off-road ATV race east of the Mississippi, the GNCC Ironman, on his family property. Growing up, Shaver would help his family prepare for and operate the race each year, and over time, he grew to respect and appreciate the work that went into planning the event. Using his experience, Shaver decided to host a 5k run on his family's property, which now after four years welcomes more than 8,000 participants each year. The overwhelming success Shaver has had using his family's property to host popular recreational events set him above the rest of participants for this year's award. "Each year, Yamaha proves their commitment in promoting responsible messages to National FFA members," said Senior Regional Director of National FFA, Maggie Stith. "The National FFA is proud to align with Yamaha's efforts to support the future of agriculture, and we thank them for their contributions to make the National Agricultural Proficiency Award possible every year." The GRANT-awarded projects support the program's industry-leading dedication to safe, responsible riding and open sustainable access to land, trails and riding areas for OHV users of all types. Yamaha continues to seek qualified projects and applications at local, state and federal levels. Outdoor clubs and organizations can now apply for a GRANT through the revitalized OAI website at www.yamahaoutdooraccess.com. The updated OAI website now delivers a more inclusive experience to the outdoor community, with an improved application process, examples of previous GRANTs awarded to various projects and social media support. "As the Yamaha Outdoor Access Initiative has grown and matured, the program's website needs to better reflect the work being accomplished by those on the ground making sustainable access a reality for outdoor enthusiasts of all types," said Nessl. "The changes to the website are intended to make it easier for outdoor clubs and organizations and land managers from across the nation to seek funding for projects that promote safe and responsible use." For more information about National FFA, visit www.ffa.org. For more information on the Outdoor Access Initiative, or to submit a GRANT application, visit www.yamahaoutdooraccess.com. Follow Yamaha Outdoors at www.facebook.com/yamahaoutdoors, www.twitter.com/yamahaoutdoors or www.instagram.com/yamahaoutdoors. The National FFA Organization is a research and support organization that does not select, control or supervise state FFA association, local chapter or individual member activities. Educational materials are developed by FFA in cooperation with the U.S. Department of Education as a service to state and local agricultural education agencies. The National FFA Organization is led by a board of directors and six student national officers. Together, they act on recommendations from the national convention delegates and agricultural education's stakeholders to set the vision and policy for FFA. The National FFA staff carries out the policies and provides programs and services for the organization. The National FFA officers represent the members and actively guide the course of the organization during their year of service. Yamaha Motor Corporation, U.S.A., (YMUS), a leader in the motorsports market, makes the toughest, most capable and versatile ATV and Side-by-Side vehicles. The company's ever-expanding product offerings also include motorcycles, outboard motors, personal watercraft, snowmobiles, boats, outdoor power equipment, accessories, apparel and much more. YMUS products are sold through a nationwide network of dealers in the United States. 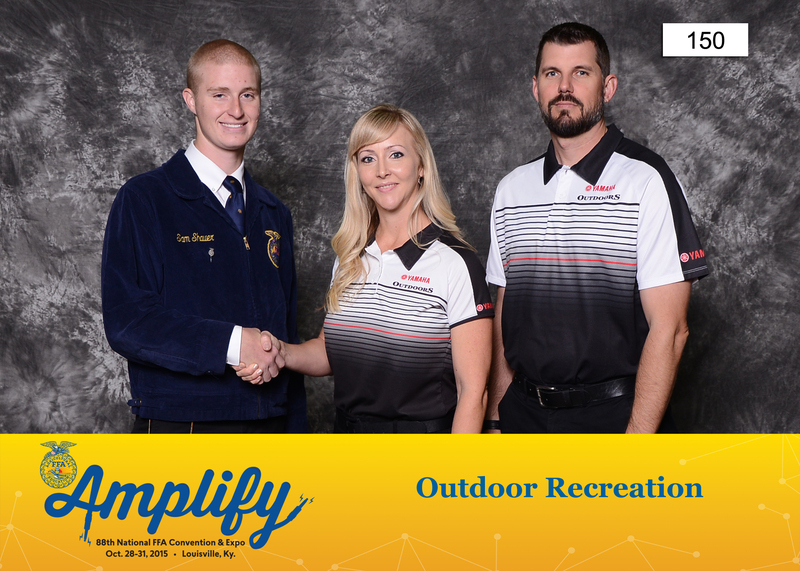 This year's Outdoor Recreation Proficiency Award was awarded to Sam Alan Shaver of the Southmont FFA Chapter in Crawfordsville, Indiana.